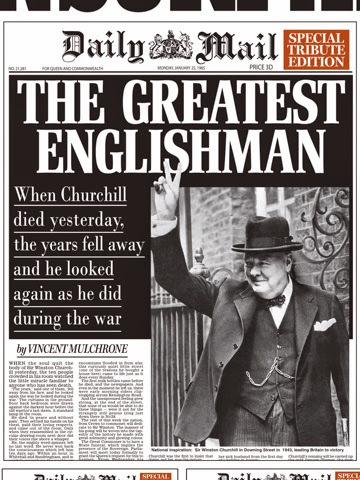 It is 50 years to the day that Sir Winston Churchill died. I am very proud to have a picture of him looking out over my office in Rockhampton. Even prouder that the picture includes a signature in his own hand writing. I know that the picture sometimes gets a few strange looks from some politicians who visit the office - even stranger looks when they see the other Churchill memorabilia around the office. If they saw my collection of Churchill stamps I think they would run for the hills! I don't really care - I simply find Churchill an inspiration. Why am I so inspired by this person? He was defiantly a flawed character (but are all of us). God knows he made lots of mistakes some of them having disastrous consequences for the country I love - Australia. He also made mistakes that had bad consequences for my beloved England. But here was a person who NEVER gave up what ever the odds were against him. Here was a person who was willing to take the tough decision. Here was a person who did not care about political party or doing what was politically correct. Here was a person who inspired the world in its darkest hour. Here was a man who had a deep love of his country and family. Here is a person who continues to inspire me 50 years after his death. I often look up at the picture when I have difficult decisions to make and say - what would you have done Winnie? I don't always take his advice which comes from the MANY books I have about his life - but I always try and live by his golden rule - Never, never, never give up.